Territory occupation : Year round in much of the species range including Britain and Ireland. Migratory populations in northern, central and eastern Europe leave their breeding sites during winter. Kite courtship starts in March. At this time breeding pairs can be seen displaying over their breeding sites. Kites do not have elaborate display flights like many other birds of prey but may be seen circling low over their nest woods occasionally dropping into the forest. The nest is built in mid-March to late April. Both sexes take part in the construction of the nest. 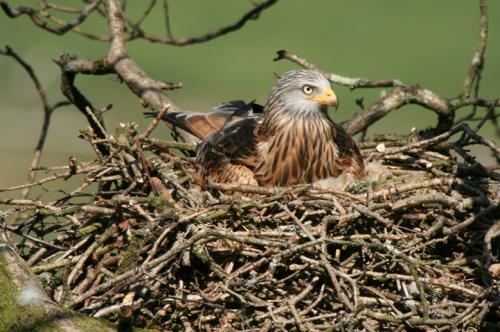 Kites generally build their own nest, but may take over an old crow or buzzard nest. Nests are generally built 12-15m off the ground. A wide range of tree species are used, both coniferous and broadleaf. Nests are commonly placed in a large strong fork near the stem, they may occasionally be placed out on the end of a large branch. Kites line their nests with wool and often decorate them with rubbish such as plastic bags and scraps of cloth. Egg laying starts in April and the eggs are laid at 1-3 day intervals. Incubation takes 31-32 days and the eggs hatch asynchronously, that is they do not all hatch together but hatch some days apart. The chicks are brooded by the female for the first few weeks of their lives. During this stage the male must supply all of the food, later in the breeding season the female assists him in providing food for the chicks. The chicks leave the nest, fledge, at 7-8 weeks. After leaving the nest they are still dependent on their parents for a number of weeks.